The President gaped as a guard appeared in the doorway and pointed his weapon at the fanged being. “Don’t shoot”, Carthew cried, but too late. The beast lay dead on the floor. Carthew sighed deeply as he confirmed his fears. The corpse on the floor was Sperling, his best secret agent, transformed into this hairy brute by the dread peril that threatened to destroy them all. So, as best as I can tell, this is the first Captain Future book. I did a minimal amount of research, mostly on Wikipedia, and this one was listed first. I’m not sure what got into my head that made me want to read another one of these. Yes, Danger Planet was my first review and I thoroughly enjoyed that book, but I was recently standing around at work and suddenly it struck me that I wanted to read more about Captain Future and I hadn’t seen any books of his floating around lately. I checked to see if my library had any of them (a lesson I learned after the Mahogany Trinrose incident) and didn’t find any, so it was time to resort to Interlibrary Loan. I say “resort” like ILL isn’t my most-used library service. This book hails from the Jack Williamson Special Collections department at Eastern New Mexico University. This is the second time I’ve gotten a book direct from them and I just want to say that I love that library. It’s important to support your local library, but if you find yourself unfulfilled after doing so, perhaps consider supporting that library too. Now that I’m done with that pitch, I’m gonna say that this book was a lot better than Danger Planet. This might be down to the fact that I’d read that one before and now I get to see a bit of origin story, but I don’t know if that’s the whole reason. Space Emperor was more tightly plotted, had better characters, and was a lot more ridiculous than trying to corner the galactic vitron market. This book had so much going for it. There’s a guy calling himself the Space Emperor. He has a de-evolution ray that turns people into “brutes,” something that given the time this book was written was probably more than a little racist in its overtones. In fact, I’m going to say this book avoided a lot of the racism trap by also being a refutation of colonialist attitudes. Captain Future gets called in because there’s a problem on Jupiter. Yes, people live on Jupiter. People live on every single planet in the Solar System, of which there are nine, and I’m pretty sure that there are also native people on every one of those nine planets. Side note: this is the second book I’ve read where Pluto has a moon named Cerberus. Well, it turns out that there’s solid land underneath all the clouds. There’s also breathable air when you get down to the dry land. Jupiter is a jungle planet, but not a jungle planet like Venus. It’s an entirely different jungle. It has a temperate climate and the surface of the planet is largely unexplored because there’s so damn much of it. Humanity has set up a colony there where it mines radium and uranium. The native Jovians are short, stocky, green, and don’t much care for humans. Still, humans manage to live side-by-side with them for the most part. I want to step back for a moment and state that while this book was not an origin story, it did manage to stick Captain Future’s origin in there just in case we were wondering about it. In fact, it was the entirety of chapter two. We get the start of this book, then this massive exposition dump, and then we’re back to the story. I’d be annoyed, except chapter two has my new favorite paragraph of any book ever. I posted this on Twitter but here we go again because it’s worth repeating. That was Captain Future’s mom talking on page seventeen, just before she died. Captain Future’s parents were killed by some guy named Corvo. It was right about there that I knew I was going to love this book. Once we get past that, though, there’s not much flashback or massive exposition dumps, unlike Danger Planet. What we get here is pretty much just action until the final scene. Hold the presses, we’re getting some new information here. It turns out that this book might not take place in the future anymore. A brief interlude with some bad guys reveals that the mastermind behind this whole Are We Not Men? We Are Devo! scheme is a figure known only as the Space Emperor. Captain Future manages to meet this mysterious Space Emperor and learns some important facts about him. He is otherwise Darth Vader. Black mask, cape, I think it’s all there. Maybe not the cape. I could be inventing that part. Captain Future figures out why The Space Emperor is the way he is. It has something to do with “stepping up” his atoms. What Cap doesn’t know is how that’s possible. It’s a mystery! It’s also a mystery how and why The Space Emperor is devolving people. Captain Future enlists his pals, Grag the Robot, Otho the android (they are different), and Simon Wright, the living brain (much more useful than a dead brain) that I imagine sounding just like Stephen Wright, so that’s awesome. Simon’s a genius, so he gets to work on a cure for the “atavism,” as everybody’s calling it. Otho can shapeshift, so he infiltrates the Jovians to see if anything’s going on on that front. Grag just hits things sometimes. Otho learns that the Jovians are following The Space Emperor, who is claiming to be an “ancient one” who will help banish the Earthmen from Jupiter and return it to the Jovians. It dawned on me as I was reading this that the plot has some remarkable similarities to westerns. We’ve got our native people who want their land back and have spiritual connections with their ancestors. The Earthmen have a frontier town (Jovopolis) set up to exploit resources and, in at least one case, the native populace. The natives are denied access to weapons to prevent any kind of uprising. There are a few western tropes that are missing, but it did make me understand why there’s such a crossover between western and science fiction authors. The Jovians are meeting with The Space Emperor at an appointed time, where he will tell them to make war against the humans. This appointed time is when the four Galilean moons come into conjunction with one another, something that I’m not sure is possible. Anybody wanna crunch the numbers on that one for me? Cap and Grag discover some ruins that belonged to the Ancient Ones. They’re near the Great Red Spot, which, if you were wondering, is an enourmous lava sea. There he meets an archaeologist who had been studying those ruins and discovered some of the wonderful technology left behind by these Ancient Ones. The Space Emperor has been keeping him there, making more discoveries and putting their high technology to work in his insidious plan. That’s where he got the matter insubstantialator and the devolving ray. Incidentally, the devolving ray works by just turning off the target’s pituitary gland. That’s all it takes. The Ancient Ones used it to study evolution. It’s supposed to be a big shocking reveal when Cap learns that the “Ancient Ones” are just regular Jovians from a long time ago. People are like “But that doesn’t make any sense! Jovians don’t have high technology like this!” and it’s a big deal that they once had a major event that took away their technology or something. This is such a science fiction staple concept that it was baffling to me that anybody wouldn’t jump to that conclusion anyway. The Space Emperor shows up while Cap is exploring these ruins and takes away his spaceship, stranding him, Grag, and archaeologyman. Cap gets the idea to use a matter thingy to just go up through the roof of the place, but there’s a problem! Hamilton throught this through: If you’ve made yourself insubstantial to all regular matter, you can’t breathe. They’re trapped forever! The Futuremen rescue our hero, who sets off to face down the Space Emperor. I was beginning to wonder if he’d make it, since the book was ticking down rapidly. There were very few pages left. Sure enough, three from the ending, Cap faces down the guy for the last time. He’s got his own ghost-making device, and it turns out that if both people are insubstantial to the world then they’re substantial to one another. Cap goes all U.S.S. Pegasus and tackles The Space Emperor, finally unmasking him. It turns out to be the vice-Governor of the Earth colony, some guy I’d forgotten about, who just wants to monopolize the planet for himself by getting rid of all Earthal competition. He’s organizing the Jovians to take out the Earthmen, who are fighting against devolved versions of themselves already. The book ends there with Captain Future saying something like “Next time the worlds are in danger, be sure to call CAPTAIN FUTURE!” and then he blasts off with my heart. This book was so much fun. I love getting into the headspace of somebody from times long past, and this book was an excellent example of that. 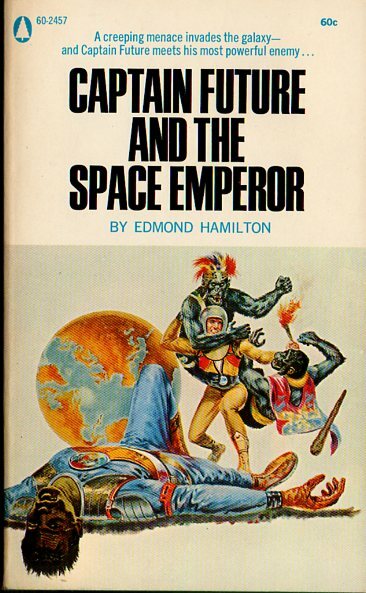 While it had some magnificent space opera storytelling you’d expect from Edmond Hamilton, it was also such a product of its times. All the planets in the Solar System are habitable, which I think I mentioned. Space travel is commonplace. You can devolve people by turning off one of their glands. There’s all that and more. One would be tempted to think that people were stupid back then and had wacky ideas, but I don’t think that at all. It was just a different time, and science fiction, at least of this sort, didn’t need that hard-hitting kind of science to tell a good story. Sure, it wasn’t long before we had our Heinleins and Clarkes and Asimovs coming ’round and saying “No, I think maybe a little scientific accuracy would be a good thing,” and while they’re not wrong, it’s also true that a good story, well told with hardly a wink in the direction of real science, can be a fun time too. I’m so glad I read this book. Again, I wanna thank the Jack Williamson Collection for sending this out to me. They didn’t have to. Most Special Collections libraries don’t do Interlibrary Loans, especially when they’re fifty-year-old pulp paperbacks that are in danger of falling apart. And when the summons came, Captain Future would answer! I first ever encountered Captain Future from S J Perelman’s hilarious snark-read of the magazine version’s debut, which it turns out was just this story! Or Captain Future had essentially the same adventure several times over, which I suppose is possible. Must admit, everything I read about the book makes it sound like an even bigger blast. Man, I just love Captain Future. I didn’t read any of the paperback versions as a kid in the ’60s and ’70s. I was too sophisticated (!*?). Now, as a rather older kid, I always have the next one nesting on my Kindle, awaiting the proper mood. I don’t recall which one it was, but there is one that includes an asteroid with a forest of gigantic flowers and a trip into Vulcan,a planet that’s way too close to the sun, but still manages to have a nice alien jungle hidden on its hollow inner surface. In later stories we get out of the Solar vicinity cuz they invented ftl drive… And appear to be well on their way to figuring out the secret of life, the universe and everything. science fiction readers (and writers) already said that, and I think, that all three of the writers you mentioned had already gotten published by then. I remember one two good short stories by him from the early ’50’s called “What It’s Like Out There?” and “The Pro” that consciously deconstructed science fiction itself.